The Indian press recently reported that China was building ‘a massive infrastructure in Bhutan’. 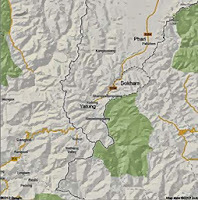 A report of Research and Analysis Wing (RAW), intelligence agency, apparently warned that the People’s Liberation Army (PLA) had constructed a new road from Gotsa to Lepola via Pamlung. While it is difficult to ascertain the details of the RAW report, it is an open secret that China has been very active on Bhutan borders. On August 9, Kuensel, a Bhutanese publication, reported that the National Security Advisor (NSA) Shivshankar Menon arrived in Thimbu to ‘congratulate’ the new Prime Minister Tshering Tobgay after the latter assumed office. Tobgay was indeed happy to host Menon in Bhutan; Delhi had just promised some 5,000 crore Rupees to assist the implementation of Bhutan’s 11th Plan and its Economic Stimulus Plan. However, oh surprise, Shivshankar Menon was accompanied by the new Indian Foreign Secretary, Sujatha Singh. Why this ‘double’ visit? The NSA does not usually travel with the Foreign Secretary. Indeed, there was more than the usual patting. It soon became clear that the NSA’s main purpose was to advise the Bhutanese Government on how to handle border talks with China. Delhi was particularly anxious after Thimbu had decided, during a previous round of talks with China, to have a joint technical field survey in one of the disputed areas in the central sector (eventually, the 21st China-Bhutan border talks held in Thimphu on August 22 agreed to conduct the joint survey of the 495 sqkm in the Pasamlung area, north of Bumthang). Another claim by China, the Doklam Plateau is adjacent to the hyper-strategic Chumbi Valley. That is the real nightmare for India. It is indeed a serious issue for India. Even if India’s special influence over Bhutan is acknowledged by China, New Delhi needs to keep a tab on the China-Bhutanese negotiations, which could definitively impact the India-China talks. Though China and Bhutan do not have direct diplomatic relations, last year, Jigme Thinley, the then Bhutanese Prime Minister met Chinese Premier Wen Jiabao on the sidelines of a United Nations summit in Rio, establishing a first formal contact. Historically, during the 1962 India-China border war, Beijing was not too happy when the Bhutanese authorities permitted some Indian troops to retreat through southeastern Bhutan. Though Bhutan formally has maintained a policy of neutrality, during the following years, Thimphu quietly expanded its economic ties with India. In the 1970s, several incidents of cross-border intrusions by Chinese soldiers as well as Tibetan herders were reported and when Thimphu and New Delhi protested against the incursions into Bhutan, Beijing ignored the Indian protest, responding to the Bhutanese complain only. In 1996, China offered a package deal to Bhutan: Beijing was ready to renounce its claim over the 495 sq kms of disputed land in the Pasamlung and Jakarlung valleys in exchange for the Doklam Plateau, a smaller track of disputed land measuring a total of 269 sq. kms located in the Northwestern part of Haa District. 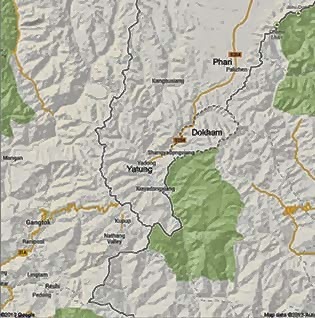 The Doklam Plateau is extremely close to India’s ‘chicken neck’ area (The Chumbi Valley) and the Siliguri corridor connecting the Northeast to the rest of the country. Since then, talks are going on. The ‘passage of time’ has shown that China was an unreliable horse, not only the PLA has intruded in several areas of India and Bhutan, but it has also built important infrastructure, such as the road from Yatung to Phari in the Chumbi Valley cutting across the Doklam Plateau. The Chinese engineers have also built traversal roads and set up a communication network within the disputed area. How to dislodge the Chinese is not an easy proposition. By grabbing the Doklam Plateau, Beijing considerably enlarged the Chumbi Valley and its access to Sikkim and Siliguri; let us not forget that the Siliguri corridor is one of India’s most critical areas along the India-China border. Let us hope that Delhi will keep watching and preserve its vital interests.